For those of you who’ve been wondering: I’m not dead, between projects and other things, I just haven’t had much time to blog. While diving into existential-land and pondering the true meaning of blogging, I’ve run many miles and drank many cups of caffeine. When I have a revelation about blogging, I’ll be sure to send you all an update. For the time being here are some recent productions. I hope you enjoy them. 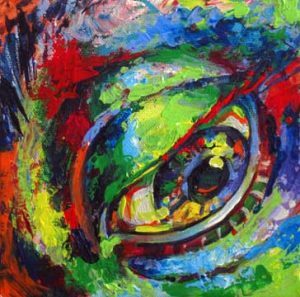 Eye painted in acrylic (left). This design seems to have become popular with the Tumblr crowd. Three cheers for Tumblr – may you remain as mysterious as the mind of a 12 year old aspiring computer programmer. 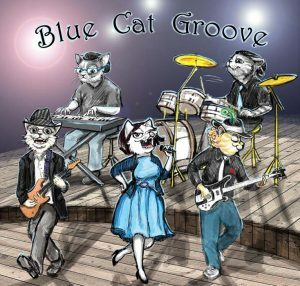 Illustration (on right) created for the band “Blue Cat Groove”. or click on the illustration.